“I can’t get in,” said the email from a worried reader. He’d signed up for the Weekly Cash Flow Summit featuring Robert Kiyosaki, and for some reason the internet gods weren’t cooperating. With the event now in the rearview, let’s address a couple of concerns about the strategy Robert laid out for viewers. For starters, let’s be upfront. We’re talking about a specific kind of options strategy. And if the word “options” scares you off, hear us out for just a moment. While the mainstream looks at a drop of water falling into a still pond, Robert looks at the ripples. So let’s take the case of a quality dividend-paying stock. Of course, the dividend is cash flow. But it’s possible to generate additional cash flow. “You can hold onto the stock and sell options on it,” Robert says. But what if a stock doesn’t pay a dividend? “Then I might try buying call options,”says Robert. “Instead of buying the actual stocks, I would buy the optionto buy the stock in the future. Then if the stock went up in value, I would sell. It’s how the rich invest. There are more opportunities to be found. A nice summary from Robert. Still a little put off? Yesterday, before the launch, I got a sneak peek at everything you’ll get once you subscribe. It might be the most comprehensive package of educational tools I’ve seen with any premium trading advisory. Given Robert’s bent for realfinancial education that schools and universities won’t provide, I’d expect nothing less. But this suite of tools is massive — including a thorough series of video tutorials… a Cash Flow Zone guidebook… a checklist for the weekly trades… and a dedicated customer-service website where reader inquiries are handled promptly and courteously. Robert and his team have moved heaven and earth to make his Weekly Cash Flow trading strategy as accessible and easy to execute as possible. If you didn’t catch the Summit yesterday, you can click here to watch the replay right now. But out of fairness to the folks who made a point of watching the Summit on release day yesterday afternoon, we’re making the replay available only through midnight tomorrow night. One more time, here’s the link. Another day, another sea of red on Wall Street. At last check, the Dow has sunk 168 points, to 24,912. That’s still more than 400 points higher than the recent low on Oct. 29… but it’s nearly 2,000 points lower than the recent all-time high on Oct. 3. Earnings season has stumbled to a close with Walmart off 1%; profit margins are getting squeezed by higher costs and by continued expansion into its online business. Northeast manufacturing: Factory activity is picking up in New York state, per Federal Reserve surveys, but slowing unexpectedly in the mid-Atlantic. The currency markets are topsy-turvy on the resignation of the British cabinet minister overseeing the “Brexit” separation from the European Union. As the Conservative Party starts tearing itself apart, the pound has tumbled 1.5%, to $1.28, approaching 18-month lows. Gold rallied a bit late yesterday and is holding onto those gains at $1,213. Apple is teetering on the brink of a bear market — down nearly 20% from its peak on Oct. 3 — but our Zach Scheidt says that’s owing largely to a one-time shift in AAPL’s business model. As we mentioned earlier this month, Wall Street didn’t react kindly to Apple’s announcement that it would no longer report the number of iPhones it’s selling — only the dollar amount of sales. Zach understands the hand-wringing. But all the same, “there’s a perfectly good reason why the company is choosing not to focus on how many items it sells,” he says. It comes back to a phenomenon we’ve mentioned before. A growing share of Apple’s revenue is coming from “services” — subscriptions to HBO, Apple Music and so on. There are few things Wall Street likes more than a predictable monthly revenue stream. So Zach is still very comfortable recommending Apple. Heck, the lower share price translates to a slightly higher dividend yield — about 1.5% now. Oil prices are firming a bit after the latest weekly inventory numbers from the Energy Department, but it has the feeling of a false dawn. West Texas Intermediate is up to $56.93… but coming off 11-month lows, that’s not saying much. “This is a big move in such a short period of time,” analyst Jody Chudley says about natural gas. It was just over a month ago Jody told us natgas was poised for a big jump, with inventory levels the lowest in 15 years. Since then, there’ve been widespread forecasts for an unusually cold winter — which are now bearing out with, for example, Houston registering its earliest-ever snowfall for the season. Thus, natgas prices have jumped 25% since the calendar turned to November. Jody’s sticking to his outlook that prices might well double before it’s all over. “The last time supplies were this low in the first week of November was in 2002. 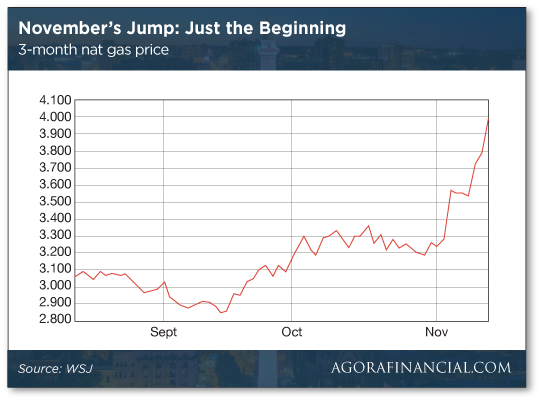 That winter the price of natural gas hit $12 per MMBtu, which was a triple from where it was that fall! His favorite way to play the trend: Cabot Oil and Gas (COG). It too is up about 25% recently, but he sees potential for a far bigger move now that new pipeline capacity is relieving a gas glut in the Marcellus Shale region of Pennsylvania. “For Cabot, that means that production is going to immediately increase by 1 billion cubic feet per day.” Management is even hinting at a special dividend. Sign of the times: Here’s an insane twist on the old story of sky-high real estate prices in the Bay Area. On Monday, the NBA’s Golden State Warriors sent an email to its fans offering a monthly “In the Building Pass.” For $100 a month, you get access to the Oracle Arena for every home game. Atmosphere, baby! It’s all about the atmosphere! Besides, you do get full access to the arena’s bars and restaurants, where you can watch the game on TV. Presumably, food and drink will be extra — heh. “It is believed this is the first time a team has offered fans a ticket merely to get into the building without viewing access,” Rovell writes. The Warriors will surely get away with it, too, having sold out every game going back to December 2012. “I respect much of what Kiyosaki says, but I have to poke a hole in some of his gold comments,”a reader writes after Tuesday’s 5. “It’s true that $100 in 1913 buys $2,500 worth of goods today. So I would strongly agree that gold is likely better than holding cash over a long-term 25-, 50- or 100-year span. “But what’s not mentioned is that the same $100 in 1913 invested in the S&P 500 with dividends reinvested would be worth around $2.5 million. “So yes, gold may be better than cash — but it far underperforms most other asset classes. Also, gold may be a hedge, but during hyperinflation it may be very tough to sell gold. It will be a buyer’s market in that scenario. “Bitcoin may be a much better hedge against hyperinflation than gold since it will likely be more easily spent and converted than gold. The 5: All true. That’s why they’re called hedges. It’s why even Jim Rickards says gold should comprise only 10% of your portfolio. Speaking of Jim, a reader writes objecting to his presence in Robert Kiyosaki’s Weekly Cash Flow Summit yesterday. “I watched for a while, then with volume turned lower, waited for the star speaker to take his place again as featured speaker. But there was ‘Mr. Mullet’ hogging the middle chair, the microphone, the camera and the program. The 5: Jim was there for an important reason —he’s been working very closely with Robert Kiyosaki’s team developing the specific trades that will generate weekly cash flow. Robert and Jim come as a package deal with this service. Robert doesn’t do business with just anybody. And he might have passed on doing business with Agora Financial were it not for the fact Jim’s been on our team for more than four years now. That’s the level of mutual respect they have. And for us to have them under the same roof? We’re mighty privileged. We hope it’s the start of a long and fruitful relationship — fruitful especially for whatever your financial aspirations might be. P.S. The genius of Robert Kiyosaki’s Weekly Cash Flow strategy is that it works in up, down and sideways markets. With one trade, you can cash out amounts ranging from $840… $4,540… to even as much as $10,600 on a WEEKLY basis. 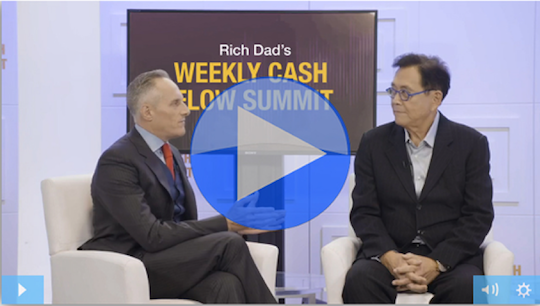 The Weekly Cash Flow Summit is still available for viewing — but only through midnight tomorrow night. Click here and you can check it out right away.